The most popular and common is the species itself with its bright deep blue flowers. They are very inexpensive and grow and naturalize almost everywhere. (Besides the species itself); 'Blue Spike' (flax blue, double flowering), 'Cantab' (light sky blue), 'Fantasy Creation' (blue with green as it matures, double flowering) and 'Saffier' (initially greenish maturing to French blue). Eurasia: muscari have originated in the old world, from the Mediterranean basin, the center and South of Europe, Northern Africa, the West, Center and South-West of Asia. 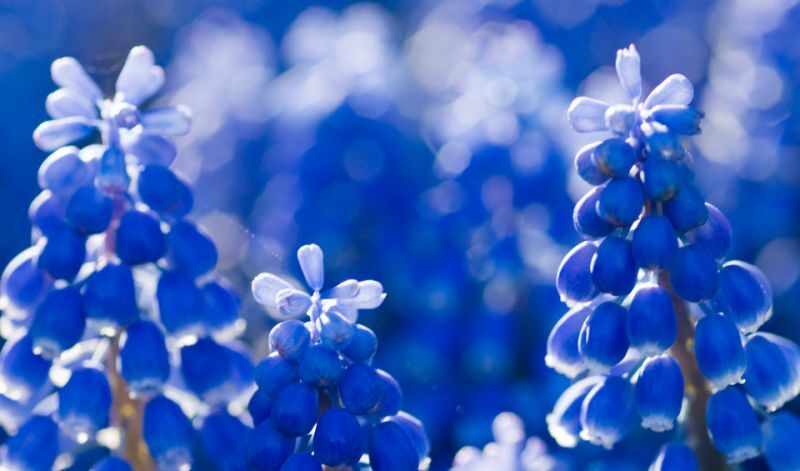 The term muscari comes from the Latin 'muscus', since the scent of the flower is said to resemble musk.